When combining objects like this for a still life I go for a certain aroma that’s achieved with the colors and the lighting used, in this case it’s an oriental feeling that I was going for and the symbiosis created by the interaction of these objects. 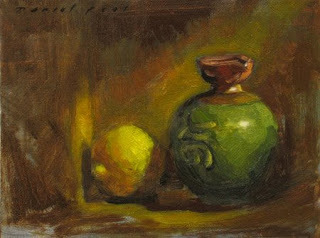 3 Responses to "Chinese Cup with Lemon – still life Art daily painting by the artist"
Hi Daniel, your work is excellent.Great drawings. You are an awesome artist, I’ve been following you . If you don’t mind, I’ll link your blog on mine.